Guide Team Publishing enables advanced knowledge management workflows, making it easy for teams to collaborate on and manage content. Teams can set up collaboration workflows to review, approve, and publish content. They can also stage content updates for published articles without affecting the live content. Articles move through various content states as needed, and can be assigned or reassigned to team members as needed. Team Publishing includes four article states and direct article assignment. You must be on Guide Enterprise to use Team Publishing. 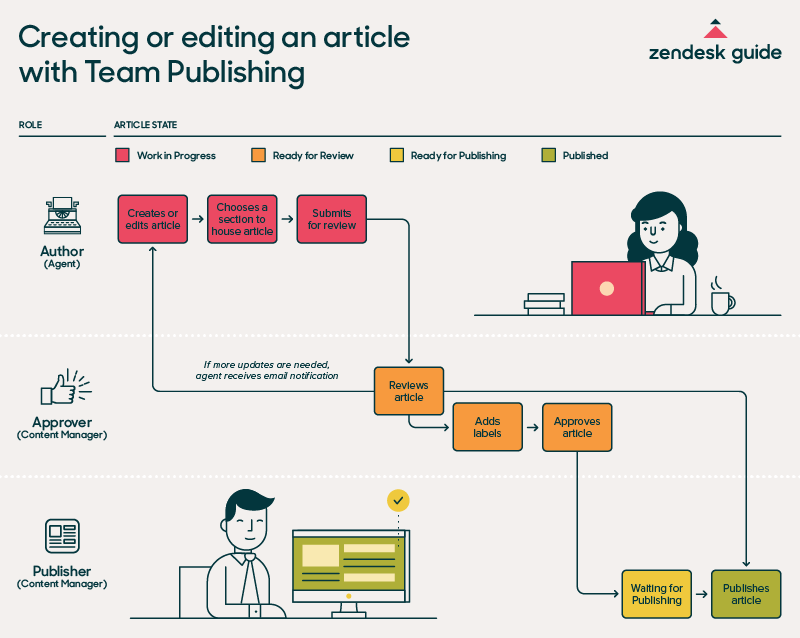 Team Publishing makes it easy for teams to collaborate on new and updated content. The following graphic shows some of the possible Team Publishing workflows. Published A published article has a live version currently published in your Help Center. This includes all live translations, if you support multiple languages. It is possible for an article to have a published version and a version in another state. Approved for publishing These articles have been approved and are staged for publishing when you’re ready. Ready for review These articles have been updated and are ready for review by another user. Work in Progress These articles are being created or updated, but are not ready to be reviewed or published. Any changes will not affect the published version of the article. Any saved changes to an article in the review or approved state will put it in a work in progress state. The article state for an article is indicated at the top of the article when it's in edit moce. If you are a Guide Manager, you can view all articles in a particular state in the associated article list. The diagram is very helpful esp since we have KCS I (Candidates), KCS II (Contributors), and KCS III (Publishers). Very relatable to KCS methodology. Thank you! Thanks, Mary! Glad it's helpful! So, with Guide Team Publishing, does this mean that the person that creates or edits the article does not have permissions to publish the article? Permissions for editing and publishing have not changed. That is set at the section level. So if someone has permission to create and edit articles in a section, they also have permission to publish in that section. When it’s released, will it be dependent on the permissions beta that is coming in early May? Right now it isn’t. Do we have to upgrade to the new Enterprise to get the released version of Team Publishing? 1) Yes, that's true. Article editing/publishing will be controlled by permission groups (as opposed to the section-level setting) when that feature is available. It will enable more granular control of your team publishing workflows. 2) Yes, you must have Guide Enterprise to use Team Publishing. 1. Yes, it's a good idea to assign the article to the reviewer when it's ready for review. It's not required, however. 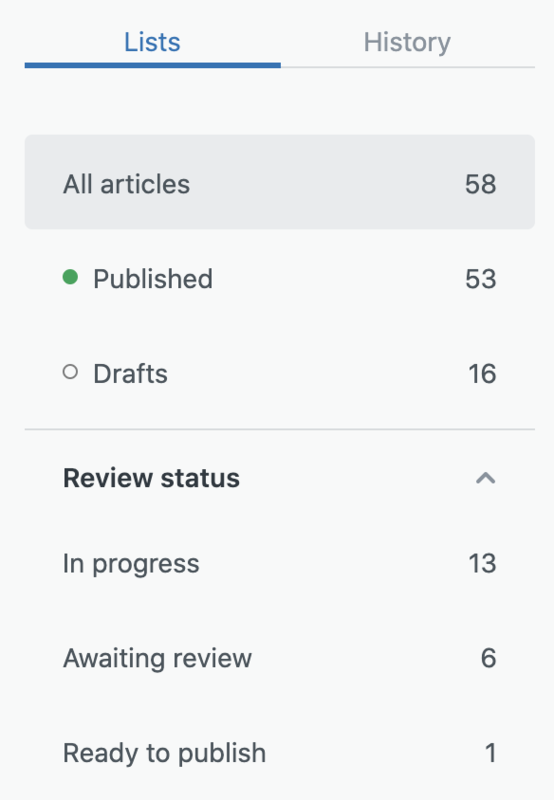 You could have reviewers monitor the Ready for Review queue (as long as they have access) and work on articles as they are ready. But if you want the reviewer to receive a notification, you should assign the article. 2. You cannot assign an article to someone who does not have permission to edit the article. So if you assign an article to a reviewer, then they will be able to make updates to it. It is possible that you might have a reviewer who does not have permission to edit the article. It just depends on permissions for the section the article is in. Hope that helps! If not, let us know. So what I can understand from it, previously with my professional account I was able to flag the article and then make a self made process of reviewing the documents. Now I'm not able to do this anymore & working without it with a multi language environment is not easy now. For my purposes, I need to assign an article to more than one person. Is that possible in this tool? For now, that's not a thing that can be done. This is done to make sure only one person at a time is handling an Article so that one person's changes don't get overridden but someone else who's assigned at the same time. Building on Krista's question from above. We would like to take the "Ready for Review" articles and assign them to a specific *group* of reviewers and then anyone in that group can then assign the article to themselves to act on. Just like workflow management for tickets. Having articles be assigned to an individual reviewer right away just bottlenecks the review process. What if that person is out of office? Meanwhile, 15 other people who could review the article are in office but don't have it assigned to them. As Keith said, right now it's set up to only be assigned to one user at a time in order to prevent two people overwriting one another. However, your use-case makes a lot of sense. You may want to post your idea in the Guide Product Feedback topic where other users can add their comments and vote, so we can get a better sense of whether this is a common need.